We absolutely love this light, filling, colorful, and super tasty salad. Feel free to make it your own by customizing it in any way you’d like. You can cook the shrimp on an outdoor grill, if you’d like. But, if you’re frying them in a pan or using the grill option built into your stove, then remember to turn on the range hood fan. It will draw up all the smoke, grease, and fishy odor from your kitchen and exhaust it to the outdoors! Preheat grill. Cook shrimp until pink. Combine cooked shrimp, corn kernels, tomatoes, avocado, radishes, cucumber, and parsley in a bowl. Add all the dressing ingredients to a blender and process until smooth. Combine dressing with salad ingredients. Enjoy! You’ll find many more delicious recipes here. This entry was posted in Cooking, Cooking with Range Hoods, Food, Recipes and tagged BBQ, easy, grill, Healthy, recipes, Salad on March 1, 2018 by Mila Hose. You will love these ribs. They are so easy to pull together. They are perfect for a game’s night get-together, an easy family dinner, or even a special, celebratory meal. Yes, they are a little messy. But, they’re so worth a few dribbles! Fire up the bbq for this recipe. Or, if you have a powerful range hood and an indoor grill, you can whip these up quickly in your kitchen. Grill jalapeños until they are charred and blistered. Place in a bowl and cover with plastic wrap until they are cool enough to handle, about 15 minutes. Peel, seed, and chop the jalapeños. Heat oil in a pan. Sauté onion and garlic until softened. Add water, honey, vinegar, hoisin, mustard, and Worcestershire sauce. Bring to a boil. Add jalapeños. Reduce heat and simmer for 15 minutes. Season with salt and pepper. Combine cornstarch with cold water. Stir into sauce and return to a boil. Boil until thick. Brush ribs with glaze as they cook on the grill. Find more great recipes here. This entry was posted in Cooking, Cooking with Range Hoods, Food, Holiday, Recipes and tagged BBQ, kitchens, recipes, ribs on January 18, 2018 by Mila Hose. It may be January, but there’s no reason why you shouldn’t fire up the BBQ! Definitely try these very delicious chicken and pineapple skewers. They’re quick to whip up and perfect when you want to impress a crowd. Some stoves are equipped with a grill component allowing you to cook up these skewers indoors. Remember to turn on the range hood fan about 15 minutes before cooking, and leave it running for about 15 minutes after you’re done cooking. Soak large wooden skewers in water for 15 minutes. Preheat grill. Taking alternate turns, thread chicken and pineapple chunks onto skewers. In a small bowl, stir together sriracha sauce, honey, and oil. Grill for about 10 minutes, or until chicken is almost cooked through. In the last 5 minutes of cooking, brush the skewers with sauce mixture. Serve with a side of rice and grilled vegetables. Find more delicious recipes here. This entry was posted in Cooking, Cooking with Range Hoods, Food, Indoor Air Pollution, Kitchen Safety, Kitchen Tips, Recipes and tagged BBQ, grilling, recipes, winter on January 12, 2018 by Mila Hose. Summer is the ideal time to get out of the kitchen and into the backyard. Along with outdoor cooking, we also need dishware that’s designed for outdoor use, too. Glasses, plates and cutlery meant to be used on the patio or at a picnic have come a long way since the days of paper plates and white plastic (and easily breakable) forks and knives. Today’s modern patioware is typically made out of strong acrylic that looks and feels like glass and china. This year’s summer designs are out and as beautiful as ever. Colorful artwork adorns dishes, glasses that replicate exactly the cut and shape of wine, water and juice glasses … they make you want to completely ignore your usual china dishes and use acrylic for entertaining instead. Even discount or department stores are beginning to carry acrylicware that sports a designer look and feel. So, there’s no excuse not to stock your patio with these beautiful collections. Have a look at this melamine plate and pitcher from Crate & Barrel. That company has actually commissioned a housewares designer to create an exclusive set for their customers. These colorful Carnival Brights plates and Kira tumblers are fun and fresh. Find them at Pier 1. Sometimes, you really want the plates and glasses to take a backseat to the food. Colorful dishes can sometimes take the focus away from the array of food on offer. In that case, a clear or solid color set is what you’re after. Target is featuring the Swivel Collection. Sturdy, functional and completely clear, these plates and glasses will showcase the meal. Over to you: What kind of dishes, glasses and cutlery do you like to use on the patio? This entry was posted in Cooking, Food and tagged Acrylicware, BBQ, outdoor living, Patio on June 15, 2016 by Mila Hose. Cocktail Recipes from Movies & TV Shows for the adults at summer BBQs and Fun Recipes for Kids for kids who are bored during their summer vacation. The best food to eat on a hot summer day is anything that is cool. Avoid turning on your oven, and don’t eat anything too heavy while hanging out in hot weather. Iced tea: Brew your favorite tea. It’s a much healthier choice than soda. For an individual serving, you can brew a concentrated mug of tea and pour it over a glass of ice. Or, you can make a big pitcher for a group of people. Agua fresca: Agua fresca is a great way to cool down. Agua frescas are simple; they include water, fruit and sugar. For a watermelon agua fresca, try the recipe pictured below from Whole Foods. All you need is some watermelon, agave nectar and lime juice. Watermelon is mostly water anyway, right? If neither of the above options float your boat, try fruit infused water or water with added cucumber and/or lemon. Coleslaw: This classic side is theperfect addition to a grilled meal while hanging out in the backyard. It’s also light and mostly made up of veggies, so it’s perfect for those hot summer days. 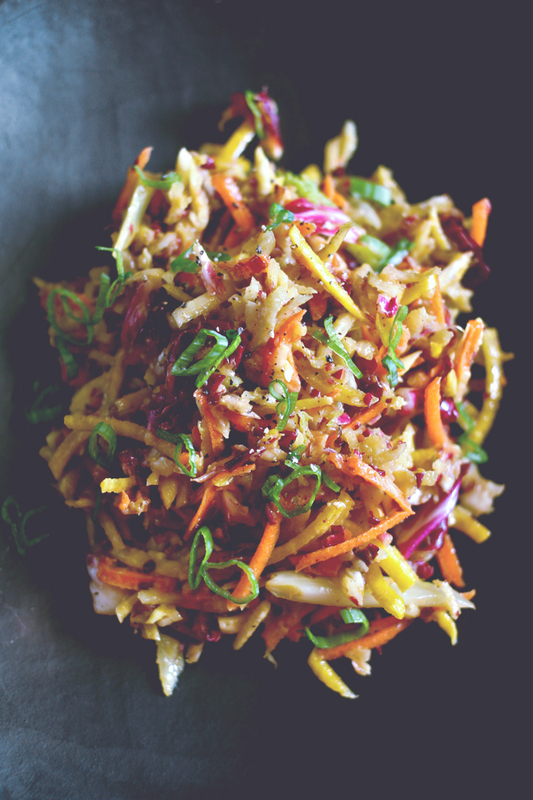 Try this recipe from Six Course Dinner, which includes carrots, golden beets, fennel, red cabbage, vinaigrette, mayo and green onion. Guacamole: It’s not a cookout without some old-fashioned guacamole, right? Give Me Some Oven has a great recipe for a classic guacamole. You don’t have to add the jalapenos if you don’t like spicy food; but if you do love spicy food, be sure to add extra jalapenos. Enjoy guacamole with veggie sticks if you’re watching your carbohydrate intake. BBQ Ribs: We don’t know about you, but we can’t wait for the first meal of ribs this summer. Julie’s Eats & Treats has a great recipe for Smokey Barbecue Ribs. These ribs are baked in the oven and smothered in a delicious sauce of garlic, 7-Up, brown sugar, honey, lemon juice and barbecue sauce. Hot Dogs: You can’t go wrong with a traditional hot dog at a summer BBQ. However, we recommend dressing up your hot dogs with some fun and unique toppings. Lay out a spread of condiments for your guests to enjoy with their hot dogs. For more information, check out 25 Hot Dogs that Went Above and Beyond via BuzzFeed. What are your favorite summer recipes? Have a great summer and enjoy! This entry was posted in Cooking, Food, Recipes and tagged barbecue, barbecue sauce, BBQ, cooking, food, grilling, macaroni and cheese, range hoods inc, recipes, summer, summer recipes on June 17, 2015 by editor.